(BENSON) Michelle Freeark, executive director of legal and corporate services, has been appointed to an Environmental Protection Agency (EPA) advisory board that issues reports directly to the office of the president on environment and other issues with the potential to impact people and communities on both sides of the U.S.-Mexico border. As a member of the Good Neighbor Environmental Board (GNEB), Freeark and other board members not only have the opportunity to develop and recommend policy directly to the president, they’re required by federal law to do so. 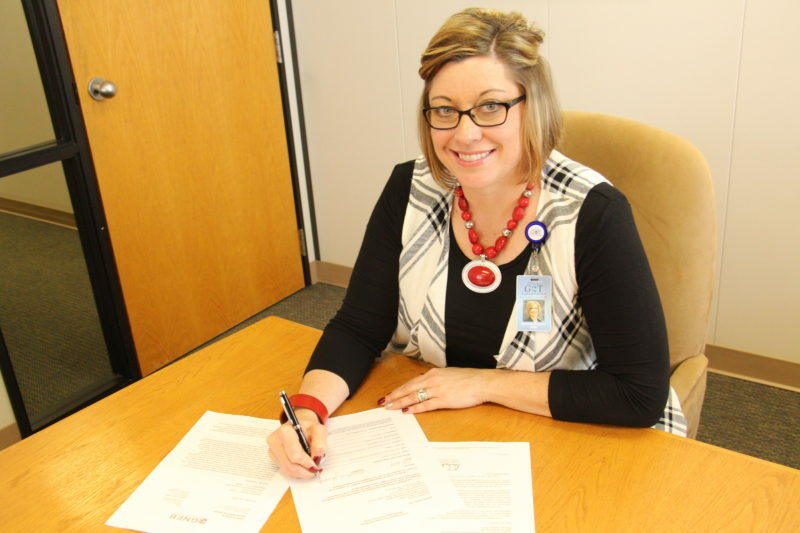 Michelle Freeark, executive director of legal and corporate services, signs the acceptance letter for her appointment to the EPA’s Good Neighbor Environmental Board, an advisory board that submits reports directly to the office of the president. The reports are considered when the president’s administration is formulating policy on environmental and other issues along the U.S.-Mexico border. The board is mandated by the Federal Advisory Committee Act (FACA), and as such is charged with providing information that can result in policy changes. The invitation to serve on the board first came during a February 2018 phone call from a Federal Advisory Committee Management Division employee at EPA, after Freeark was recommended as a board member by staff at the Arizona Department of Environmental Quality. Following that, EPA Acting Administrator Andrew Wheeler submitted a formal letter, inviting her to serve. Freeark’s resume and background had to be vetted for the appointment to be approved, and she will be required to attend an orientation session for board members as required by the FACA. “On these committees, there are board members, and then there are stakeholders, from agencies like NOAA (National Oceanic and Atmospheric Administration), the Department of Health, the Department of Homeland Security, the EPA, and other governmental agencies. I’m a board member,” Freeark said, and as such, has direct input into the reports that will help determine national policy. “Our main mission is every year the board is required to submit a report to the president, and that report has to detail any findings, research, and suggestions for policy improvements, or new policies that the president or Congress should undertake,” Freeark said. “My written contribution was about what’s currently happening in Mexico, reference energy issues, how they are structured when it comes to regulation, and the investment they’re currently putting in to their high-voltage transmission systems and generation, and the money they’re spending on renewables, and how all that impacts the U.S.,” Freeark said. “We already have essentially the outline for 2019. We will be having a monthly board call, and two face-to-face meetings a year,” Freeark said. Board members have open dialogue on issues and several discussions take place before a final report is written. Approval by a quorum is required before the report can be transmitted to the president. On the recent teleconference meeting of the board, a tentative meeting was scheduled for March in San Diego. “Typically, the face-to-face meetings include substantive sessions with experts speaking on the report topic, work sessions on the report, public comment, and board business. If possible, a site visit relevant to the report is organized,” Freeark said. “Some of these issues are all about socio-economic issues and health, on both sides of the border, where it’s impacting,” Freeark said. Freeark’s appointment is a two-year term, after which she can be appointed for a second two-year term, if she decides to accept it. “It’s exciting to be a part of something that could really have an impact on these critical issues at the border,” Freeark said. This entry was posted in Articles, Carousel. Bookmark the permalink.